Col. Burton H. Catledge is the commander of the 45th Operations Group at Patrick Air Force Base, Fla. He oversees the Eastern Range’s military, commercial, NASA, and ballistic missile launch operations from Cape Canaveral Air Force Station and Kennedy Space Center to Ascension Island, South Atlantic. The 45th Operations Group operates and maintains $20 billion in instrumentation and infrastructure for the 15-million square mile Eastern Range, operates three airfields, and supports 10,000 customers with communications services. Col. Catledge is a 1995 graduate of the University of Northern Colorado and was commissioned through the Colorado State University Reserve Officer Training Program. Prior to his current assignment, he was Deputy Director, Cyber and Space Programs, Office of the Under Secretary of Defense for Acquisitions, Technology and Logistics/Deputy Assistant Secretary of Defense (C3, Cyber and Business), Pentagon, Washington, D.C.
1995 Bachelor of Arts, University of Northern Colorado, Greeley, Colo.
2000 Master of Arts, in Human Resource Management, Troy State University, Troy, Ala.
2002 USAF Space Weapons Instructor Course, Nellis AFB, Nev.
2008 Air Command and Staff College, Maxwell AFB, Ala.
2008 Master of Military Operational Art and Science, Air University, Maxwell AFB, Ala.
2009 School of Advanced Air & Space Studies, Maxwell AFB, Ala.
2009 Master of Airpower Arts & Science, School of Advanced Airpower Studies, Maxwell AFB, Ala.
2014 Master of Science in National Resource Strategy, Dwight D. Eisenhower School of National Resource Strategy, Fort Lesley J. McNair, Washington, D.C.
1. May 1995 – February 1996, Student, 392nd Training Squadron, Vandenberg AFB, Calif.
2. March 1996 – April 2000, Deputy Missile Combat Crew Commander, Deputy Missile Combat Crew Commander Evaluator, Missile Combat Crew Commander, Missile Combat Crew Commander Instructor, Chief of Standardization/Evaluation Scripts Section and Missile Combat Crew Commander Senior Crew, 341st Missile Wing, Malmstrom AFB, Mont. 3. May 2000 – December 2002, Deputy Crew Commander, Crew Commander, and Chief of Standardization/Evaluation, 2nd Space Warning Squadron, Buckley Air National Guard Base, Colo.
6. August 2007 – July 2007, Student, Air Command and Staff College, Maxwell AFB, Ala.
7. Aug 2008 – May 2009, Student, School of Advanced Air and Space Studies, Maxwell AFB, Ala.
9. 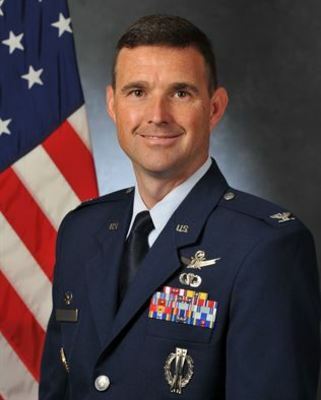 June 2011 – July 2013, Commander, 2d Range Operations Squadron, Vandenberg AFB, Calif.
Lesley J. McNair, Washington, D.C.
11. Aug 2014 – Jun 2016, Deputy Director Cyber and Space Programs, Office of the Under Secretary of Defense for Acquisitions, Technology and Logistics/ Deputy Assistant Secretary of Defense (C3, Cyber and Business), Pentagon, Washington, D.C.
12. Jun 2016 – Present, Commander, 45th Operations Group, Patrick AFB, Fla.